Irish horror film The Hole in the Ground, to be distributed across the country by Merrion Square-based company Wildcard Distribution, recently had its world premiere at the Sundance Film Festival in Toronto. Upon its premiere, it received excellent notices from critics. 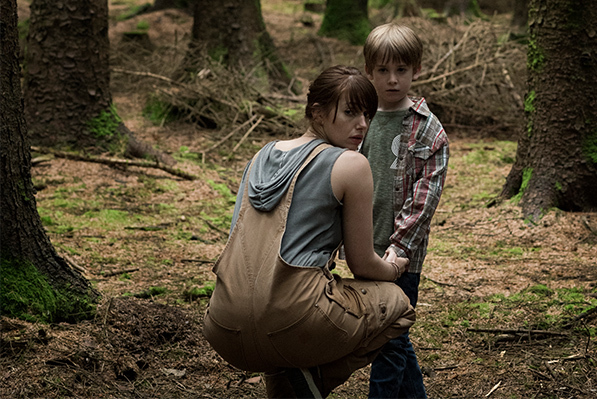 The Hole in the Ground follows Sarah O’Neill (Séana Kerslake) who is trying to escape her broken past by building a new life on the fringes of a backwoods rural town with her young son Chris (James Quinn Markey). A terrifying encounter with a mysterious neighbour shatters her fragile security, throwing Sarah into a spiralling nightmare of paranoia and mistrust while she tries to uncover if the disturbing changes in her little boy are connected to an ominous sinkhole buried deep in the forest that borders their home. The film shot on location in Dublin, Kildare and Wicklow and was produced by Conor Barry and John Keville for Savage Productions with Benoit Roland and Ulla Simonen for Wrong Men and MADE. The film was funded by Screen Ireland, the BAI and Headgear Films with support coming from Wallimage and the Finnish Film Foundation.